Specially priced, this EcoAdventures package features the highlands of Cuzco, Machu Picchu and the Inca empire. Extend your vacation to Peru by adding a tour to the north of Peru to see the renowned archaeological discoveries at the tomb of Lord of Sipan or south of Lima to the Plains of Nazca. Also, be sure to check out EcoAdventures' extensions to the Peruvian Rainforests of Iquitos or Puerto Maldonado. Day One: Arrive Lima Start your adventure into the Land of the Incas. Transfer to your selected hotel. Day Four: Machu Picchu Overnight A special adventure begins. Depart by train* and journey back into the mists of time, arriving at the foot of Machu Picchu. 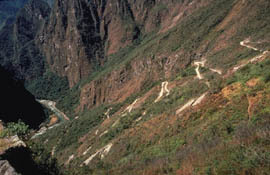 Mini-buses follow a serpentine road to the heights of the ruins. Day Five: Machu Picchu to Cuzco Continue to explore Machu Picchu before winding back down the mountain by bus to catch your afternoon train for Cuzco. 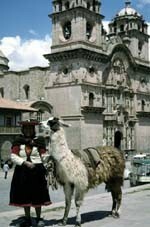 NOTE: Click here to extend your tour to Lake Titicaca and Bolivia. IMPORTANT NOTE: Airfares quoted are subject to confirmation in the inventory required for the quote. Inventory is limited and airfares quoted are subject to change without notice and cannot be guaranteed until tickets are issued. *In Tourist Class, the Expedition Train is quoted and lunch is NOT included. In First and Deluxe categories, the VistaDome Train is quoted with a private guide. Dinner is included at El Mapi Inn. In the Deluxe categories dinner is included at the selected Machu Picchu hotel. **Single Supplement applies to a traveler in a Single room traveling with one or more persons. It does not reflect the rate for a single person traveling alone. For the extra adventurous, follow the path of the ancient Inca along the Inca Trail Trek.